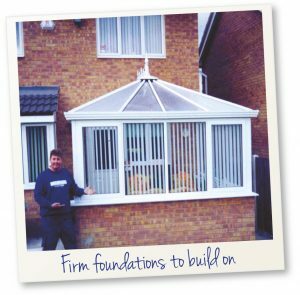 Jason Smith started the business from a small sales outlet in Barnsley Indoor Market in 1993, selling fitted windows and doors to very discerning, no nonsense, local customers. A former pupil from Wath Comprehensive, and only 21, Jason had recently completed his apprenticeship as a joiner for Woodcock Windows. Joanne, his future wife, and still at college, helped out at weekends. 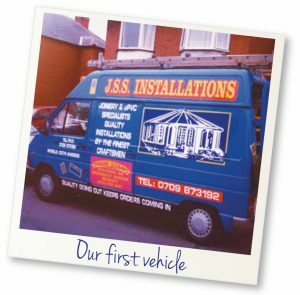 It was from these modest beginnings that JSS Installations emerged to become a premier designer, manufacturer and installer of high quality PVCu doors, windows and conservatories. Manufacturing began in 1998, from premises in the Pogmoor area of Barnsley. In 2000, JSS moved to their present site, occupying a modern units (13), consisting of a showroom and factory, and an aggregate facility, on Aldham Industrial Estate, Wombwell. Customers are welcome to visit the showroom and tour the factory where skilled craftsmen can be seen using state of the art equipment and machinery. Products are also on display at the Upper Charter Mall, Barnsley. Twenty-six staff are now employed, including a dedicated service engineer, 6 sales and customer care people and teams of experienced fitters. The quality of workmanship and service that Jason’s first customers appreciated continues to be the hallmark of all business. Customers remain confident and happy about completed projects, often returning to JSS for new or updated work. JSS’s continuing high standards are also appreciated by growing trade orders. FENSA registered JSS Installations has established itself as a brand leader in a very competitive marketplace, based on high quality products and service second to none.